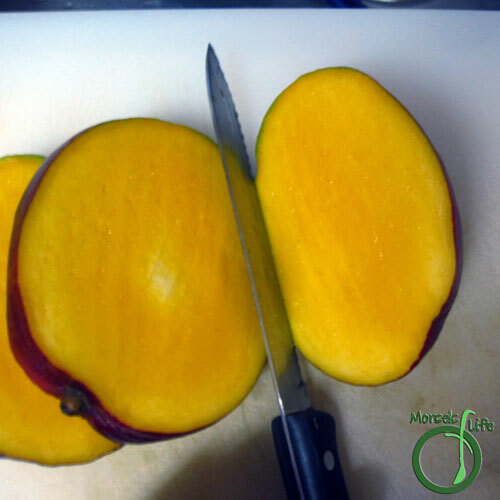 Find out how to cut a mango easily using this simple slicing method. Don't know how to cut a mango? 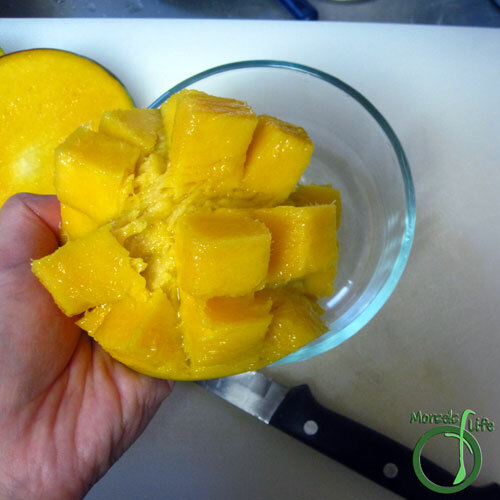 No worries - after reading this post, you'll know at least one way to neatly cut a mango without getting yourself completely sticky with juice. If you've got a really ripe and tasty mango, there's no real way around it, as soon as you make the first cut, some juice will come out. (Try to avoid licking your hands until you're finished cutting!) The general idea is to cut around the large, flat seed in the middle of the fruit. I like to cut as close as possible to the seed so I can get as much of the flesh as possible. Of course, this method is just the method I prefer. If you've got another method, feel free to share in the comments! How do you like to eat mango? 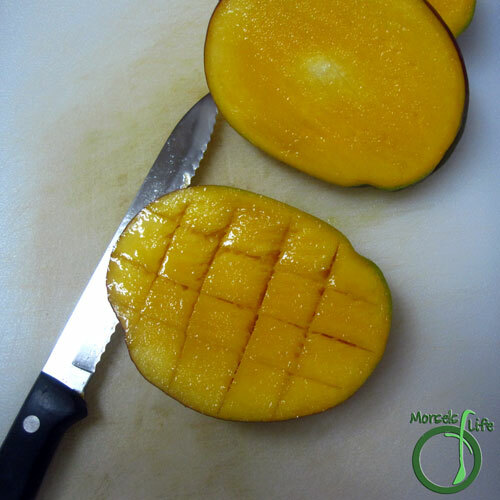 What method do you use to prepare your mango? 1. 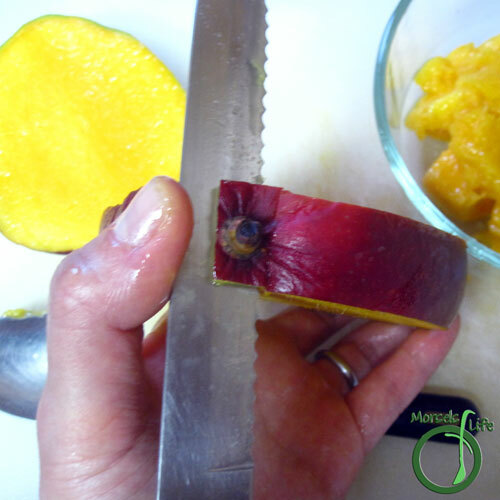 Slice through the mango to one side of the seed. 2. Repeat for other side. 3. Cut a cross hatch pattern into each side of the mango, making sure not to cut the skin. 4. Flip each half inside out. The flesh will be easy to scoop out at this point. 5. Make a cut on either side of the stem. 6. Pull skin around seed off. That mango looks so good! Thanks for the instructions - and Thanks for sharing at the What's for Dinner link up! Yum! 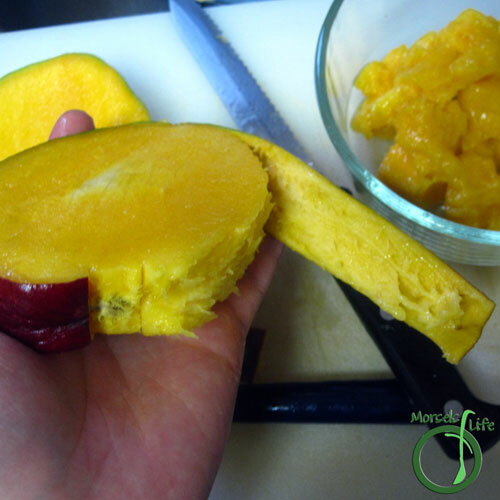 I loved eating mango when I lived in Hawaii... have you heard of or tried the cup method of peeling it? That's a fun party trick. Thanks for posting this on the #sustainablesunday link up! Great tip!. I love it CJ. I always think it is such a waste to cut the mango. There should be a mango corer like the apple corer. I tried that one time. Not large enough for the mango seed. Thanks for sharing at What'd You Do This Weekend. Love this tutorial. Thank you for sharing at the Delicious Dishes Recipe Party this week! I didn't know there was a way to cut it. My daughters eat it more than I do. Hi Janice! You definitely don't have to cut a mango the way I'm showing here. :) It's just the easiest way I've found to get to that delicious mango flesh with the least amount of work. :) Thanks for stopping by! Give it a try and see if you think it's easier. 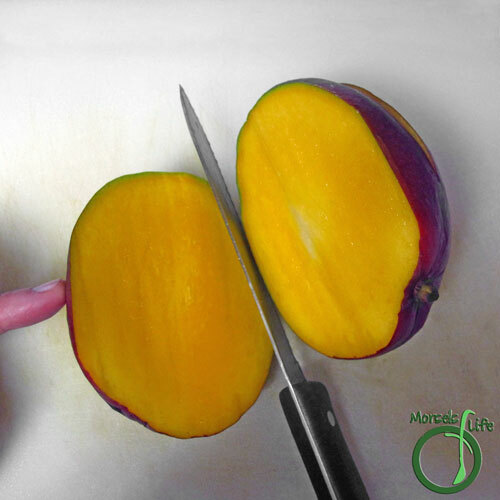 :) How do you usually cut your mangoes? I'm always like to learn new ways!